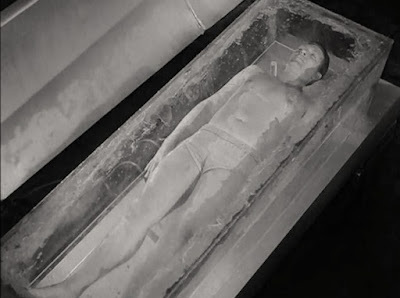 A well-worn -- yet still fascinating -- science fiction trope involves suspended animation, the process whereby a person is metabolically "frozen," usually in a tube, capsule, or bed of some type, for a very long time, sometimes for centuries. 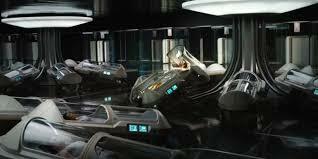 Sometimes suspended animation is utilized for crews on long interstellar voyages (Pandorum  or Passengers ). 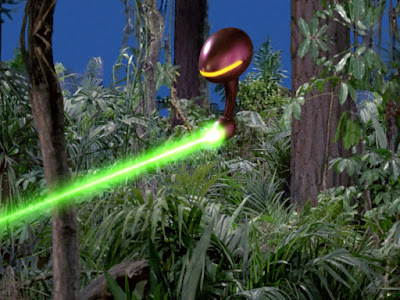 Sometimes it is used because a patient has contracted a terminal illness, and a cure has not yet been discovered (The Starlost, Star Trek: The Next Generation, etc.). The idea there is that the sick person will be awakened in the distant future, and healed of their malady. Going back more than sixty years, the science fiction cinema and cult-TV catalog have obsessed on suspended animation, and the myriad things that could go wrong in the long-term application of cryonics. Accordingly, you will find below a list of the ten worst things that could happen to you in suspended animation, at least according to popular movies and TV shows. What's the point? If you try to trick the clock and go the suspended animation route, be careful! 10. 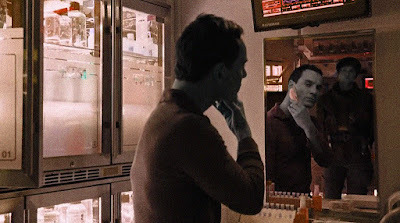 You awaken from your hibernation tube and find that all your belongings and fortune no longer are worth a penny, because man of the future -- your new present -- is now enlightened to the point that money is obsolete. Your brokerage and banks cease to exist! You went to sleep a millionaire, and now you're expected to take up pottery, or learn the flute. 09. You go to sleep with a group of other crooks, having stolen a fortune in gold in a daring caper. You hope to sleep for a hundred years, wake up, and spend the money when no one is still looking for you. 08. You wake up from suspended animation at the wrong time, almost a century too early. 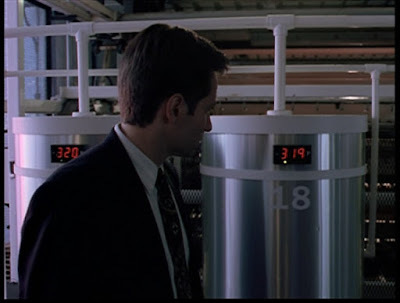 This means that because of a cryonics malfunction, you'll have to spend the rest of your life completely and totally alone, waiting for the rest of the sleeping crew to wake up. Either that, or you will have to do something completely unethical: wake up a companion so you will have someone to share your misery with you. [Passengers (2016)]. 07. 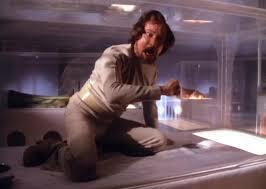 While you are sleeping on a long space journey, your suspended animation tube cracks, and you die slowly in your sleep. Admittedly, this fate is nightmarish, but at least you have no awareness about what has gone wrong. You just fall asleep in your tube, never again to awaken. 06. As a genius and philanthropist, you are awakened into a post-apocalyptic world with the world's greatest minds, the very people who can save the ruined world and build a brighter future. But you went to asleep, decades ago, infected with the very plague destroying the world. Now, there are six "greatest minds" left alive in this future world, and only three does of vaccines for the plague. 05. You have just died, apparently, in a car accident, but -- good news! -- your head has been saved and put into cryogenic sleep, in a small silver, temperature-controlled tank. 04. You are put into cryonic sleep because you are suffering a fatal disease (in this case, a "radiation virus.") The idea is that, in the distant future, you will be awakened, and cured of this currently untreatable malady. Instead, however, two uneducated farmers awaken you early, and you die of the virus because a cure has not yet been developed, even in the far future. D'oh! (The Starlost: "Lazarus from the Mist." ). 02. The Earth is decimated and sterile, but you are selected to go into suspended animation, and, centuries hence, re-populate the dead planet as it is reborn. 01. You lie, cheat and steal your way into a berth on a ship headed home to Earth. It will take 75 years to get home, so you will have to be put into suspended animation for the trip. Unfortunately, you are so suspicious and paranoid, given your methods of boarding the ship, that you don't let the crew tend to your capsule. Accordingly, you wake up one hour into your 75 year trip to find yourself fully conscious, trapped in a hermetically sealed chamber. 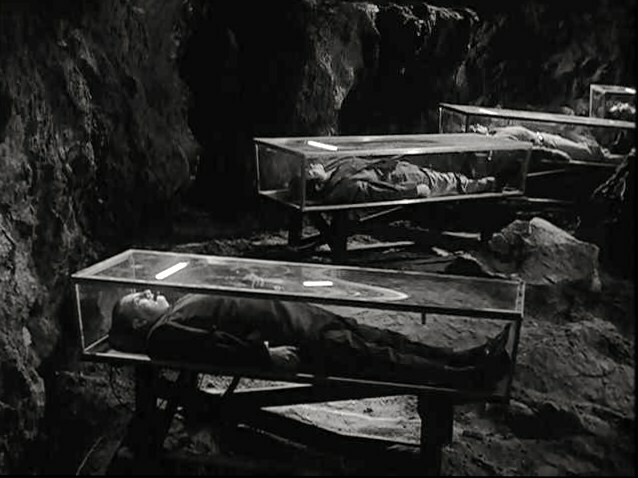 The crew is all comfortably asleep, so no one can hear your plaintive cries as you find yourself, essentially, buried alive in your coffin. Enjoy the trip home! (Space:1999: "Earthbound." ). In The Twilight Zone episode "The Long Morrow," an astronaut (Robert Lansing) slated to go away on a long trip to another solar system falls in love with a beautiful young woman (Mariette Hartley). 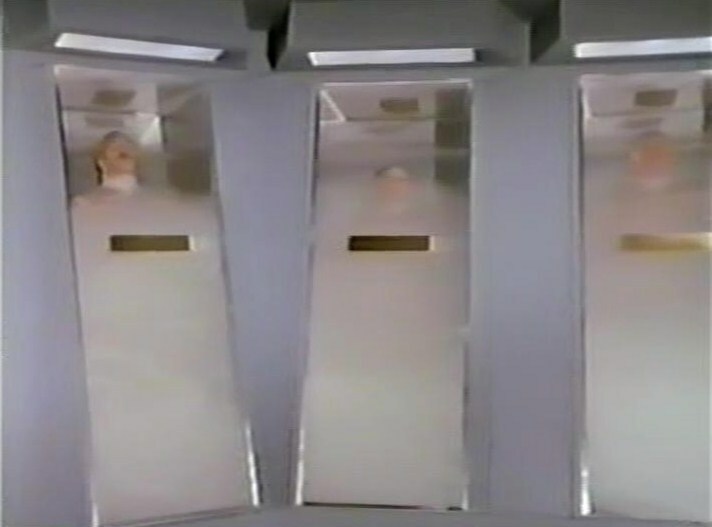 The lovers realize that by the time he returns from his space voyage, she will be an old woman, and -- because of suspended animation -- he will still be young. They part, sadly. On the long trip, however, the astronaut decides not to go into suspended animation, growing old as he travels. 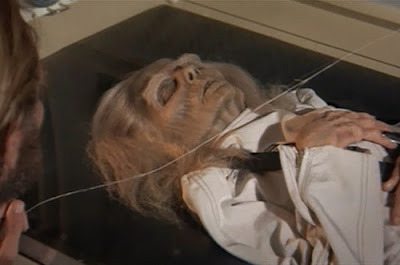 He returns to Earth an elderly man, only to find that his lover went into suspended animation upon his departure, and has remained a young beautiful woman. Talk about star-crossed lovers! Also, one can't forget Alien: Covenant (2017). Here, a mad android named David has the run of a "sleeper ship," and also two thousand colonists in suspended animation. 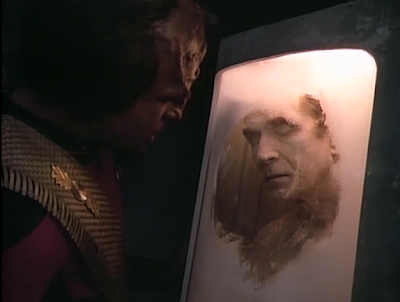 His plan: to experiment on the sleeping colonists with alien DNA, making him a Dr. Frankenstein on a colossal scale. 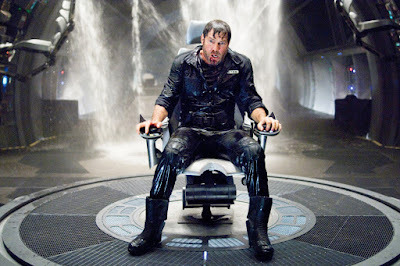 This movie also shows what happens to a sleeping human (James Franco) when a fire sweeps the suspended animation bay. Not a pretty picture. Labels: What's the Worst that Could Happen? Fascinating subject, John. 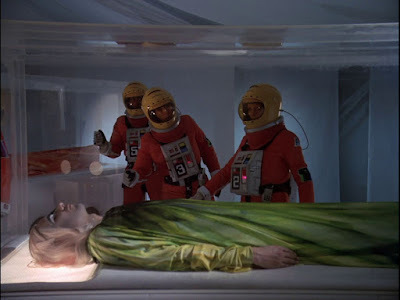 STARLOG magazine should have done a Photo Guidebook on Suspended Animation from Lost In Space(1965-1968) to Genesis II(1973) and Strange New World(1975) to all that you mentioned.